Liquid chromatography in biomedical analysis: basic approach (C.K. Lim). 2. Optimization of liquid chromatography for biomedically important compounds (T. Hanai). 3. Amino acids (Y. Ishida). 4. Bile acids (J. Goto and T. Nambara). 5. Carbohydrates (S. Honda). 6. Catecholamines (K. Mori). 7. Fatty acids (T. Hirai). 8. Nucleotides (C.K. Lim). 9. Porphyrins (C.K. Lim). 10. Prostaglandins (T. Hirai). 11. Steroid hormones (T. Hirai). 12. Miscellaneous (T. Hanai). Subject Index. This book presents a guide for the analysis of biomedically important compounds using modern liquid chromatographic techniques. 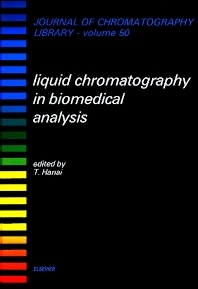 After a brief summary of basic liquid chromatographic methods and optimization strategies, the main part of the book focuses on the various classes of biomedically important compounds: amino acids, catecholamines, carbohydrates, fatty acids, nucleotides, porphyrins, prostaglandins and steroid hormones. The different chapters discuss specialized techniques pertaining to each class of compounds, such as sample pretreatment, pre- and post-column derivatization, detection and quantification.